In Ep. 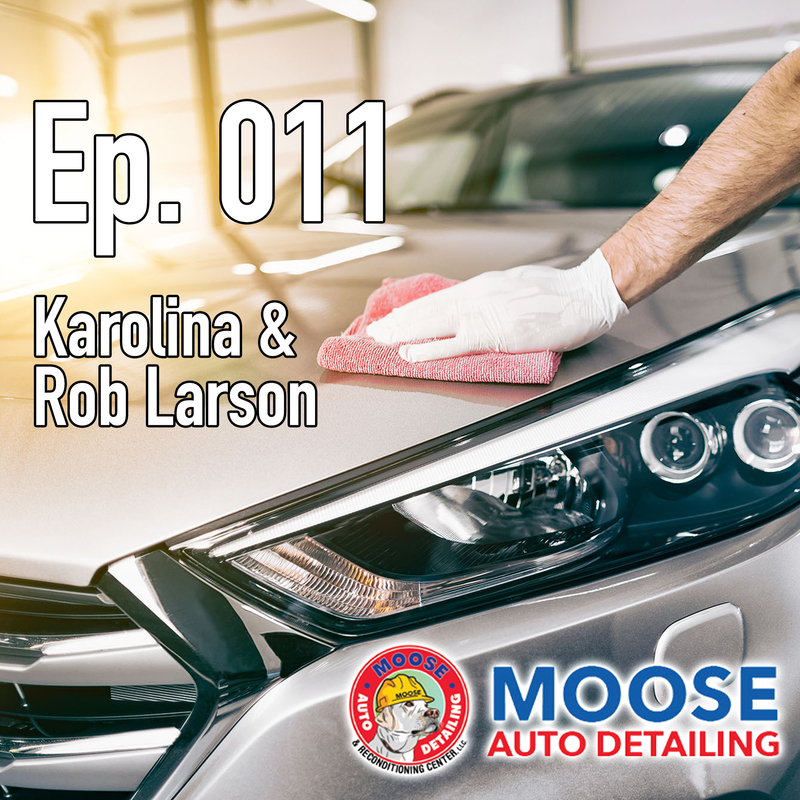 011, Tim talks with Karolina & Rob Larson from Moose Auto Detailing. They talk about how the company got started, the various services they provide their customers, what it’s like working together as husband and wife, and much more! With Spring weather right around the corner, it’s time to get that car detailed! First, check out Ep. 011 of Living With Money! Tim Mullooly: Welcome back to Living with Money. This is Tim Mullooly. On today’s episode, I have Karolina and Rob Larson here from Moose Auto Detailing. Guys, thanks for coming in. I appreciate you taking the time. Karolina Larson: Thank you for having us. Rob Larson: Happy to be here. Tim Mullooly: Moose Auto Detailing actually just opened on December 1st of last year, right? Tim Mullooly: A couple months in, how are things going? Karolina Larson: Really good. We’re happy with the team that we have in place right now. It took a little while, but we are happy with our manager, how it’s been going since December. It’s a learning process, like every other business, and we’re just doing the best to provide the best, exceptional service at an affordable price. Tim Mullooly: Yeah. Now, I don’t know much about the auto detailing business, but tell me if I’m wrong here. I feel like the winter might be a busier season for detailing with all the snow and salt on the cars. Is that right or completely wrong? Rob Larson: There’s definitely some truth to that, but I think also in the Spring and Summer is when people want to get their nice car out of the garage and get it all shiny and nice and take it out on the road and show it off a little bit. We’re actually expecting business to pick up more as the weather breaks. Karolina Larson: We’re hoping to make a really good profit in the next couple months. Rob Larson: Profits is important. Tim Mullooly: Right, that’s the name of the game. How did Moose Auto Detailing get started? Where’d you guys get the idea for this business? Rob Larson: Well basically, I was looking at, our main business is Larson Ford in Lakewood. I was looking at how much we were spending on just detailing our own vehicles. We have a lot of other businesses around us that I know need detailing services and reconditioning services too; dent and ding repair, minor body work. My wife at the time was looking to leave corporate and work somewhere more local, and we had the space available, we had some turnover in a rental building that we had and I brought this idea to her and told her I think it could be a great opportunity as not just a side business but an area where we can turn into a profit center, where the business is already there for us. She was on board and thought it was a good idea and wanted to jump in. That’s really how it got started. Tim Mullooly: How long after deciding to start this business, how long did it take to actually get things up and running, and what was that process like? Karolina Larson: Well you know, the beginning stages of starting a business, the basics, like, you have to sign up for a credit card, start the bank account, put in money, try and figure out what types of advertising you’re going to do, what type of team you want to have that’s solid to start. For example, like, our manager, which we’re very lucky to have. Basically, just the basics from setting up QuickBooks, doing all the payroll, so that was my end that I was really good at, and setting up all the legal forms and HR and whatnot. Karolina Larson: That was for, like, the first two months, three months. Rob Larson: It was a few months process. Karolina Larson: It was great, because it’s a learning process and you always want to get better and better with whatever you’re doing. Tim Mullooly: Right, exactly. You guys are husband and wife. We’ve actually had a couple family businesses on the podcast already. I work with a family business, a little different with father and brothers. What’s it like working as husband and wife? Rob Larson: I’ve been working at a family business pretty much since I’ve been 14. I can’t say I wasn’t a little concerned about being in a family business and then expanding that more even being in business with my wife, because you know, you want to come home and have peace and serenity if you can. Just talking about her with the idea of it and her motivation, and I really knew I needed someone on the accounting end, that’s the most important part of any business. It just kind of all came together and I think we both just knew it would be a good fit for us. It’s gone very well, I think. Of course, you know, we don’t get along about everything. Karolina Larson: That’s like every married couple. You fight one second and then you want to kiss and make up the next. Tim Mullooly: Exactly. That’s what I was going to bring up next. I was going to say, what are some of the main benefits that you see being able to work with your husband and your wife? Also, vice versa, you know, some of the challenges that might come up working with family? Karolina Larson: Well, I think one of the main tips I would give is to not put any emotions in business. To just think logically and what’s the best thing for the business. Then when you go home, personal is different. Tim Mullooly: Right, being able to separate personal lives from work lives and, you know, not taking things personally at work. Karolina Larson: That’s big, yeah. Rob Larson: I would say some of the benefits are definitely having something that’s your own and you can watch grow together, and put your blood, sweat, and tears into it. Hopefully you’ll be a great success and then you can both kind of share in that together. The challenges are definitely being, whether it’s a married couple or in a relationship with the person you’re in business with, you’re going to disagree about things, it’s inevitable. At the end of the day, you got to be able to turn that light switch off and go back to just being husband and wife, or whatever it may be. Tim Mullooly: Right, yeah I definitely agree with what you’re saying about putting your own blood, sweat, and tears into something and having that mutual investment in the business and watching it grow and being able to see the rewards from that is definitely very worth it. Tim Mullooly: Right, that is very true. Sometimes you got to put in the hard work to make it count. Rob Larson: Finding the right people is always the biggest challenge, especially nowadays. Karolina Larson: People that actually are willing to show up to work. That, personally, I don’t get, but that’s another story. Tim Mullooly: I have a flyer here that lists a handful of different services that you guys have. What would you say are the main services that you can offer your clients? Karolina Larson: Well, we provide the main, a full comprehensive hand wash and wax, and an express detail for our bargain price. We do all types of reconditioning work such as, like my husband mentioned, dent and ding repair, minor body work, bumper repair. Our main service is fleet detailing for dealerships and the businesses that are around us and in other cities. We’re now just getting into advertising to go after retail customers. Rob Larson: Sure, I mean, we have no issue with kind of customizing to what the customer needs, and we do that a lot already. Someone will come in and they only want the interior of their vehicle done, or maybe they only want the exterior or they want a specific thing worked on, they have a spill in their vehicle or whatever it may be. Our manager along with our team has no issues with that at all. We encourage any business that anybody wants to give us. Karolina Larson: A lot of the businesses, for example, some of them they bring in trucks and they want to get the lettering off of their truck, we do that too. Anything from deep steaming your carpets to your interior, seats, everything. Tim Mullooly: Like I said before, I’m not too well versed in auto detailing, and it might seem like common sense to some people, but what would you say are the main benefits of getting your car regularly detailed? Rob Larson: I would say there’s a couple different benefits. I think just in general in life, psychologically, cleanliness is very important. I think when you get into a clean vehicle in the morning when you go to work, you’re going to feel better about the day and you’re going to feel better as an individual. You know, also, if you’re going to plan on reselling your vehicle. For fleet purposes with businesses, you want your fleet to look sharp and professional on the road. If you see a construction company out there and all their work trucks look really clean, I think it sends a message to their clients and people that see them out there. Tim Mullooly: Right. Obviously, with the last name Larson, you said you’ve been working at Larson Ford for a while, pretty much your entire life. How does this Moose Auto Detailing business tie in with Larson Ford, if at all? Karolina Larson: In essence, Larson Ford is basically our customer to Moose’s Auto Detail. We’re in essence doing business for ourselves. Tim Mullooly: Right, well it makes sense. Rob Larson: Just to clarify, too, the name Moose actually comes from Larson Ford advertising. We had our family yellow lab that was in all of our commercials and it really built an incredible brand for the business. We didn’t want to give up that brand completely, but we needed for our dealership to be able to have a new direction to go in. This was kind of something that we could do that kept the Moose brand alive and kind of in memory to him and everything. That came together in that regard. Tim Mullooly: I remember, you know, I’ve lived in Wall my entire life, so growing up I remember seeing the Larson Ford commercials with Moose, the dog on the commercials. My brother introduced Karolina and showed me the flyer with the dog on it, I was like, “Oh, I know these guys.” Are there any sort of special offers that you guys have for people, if they buy a car at Larson Ford, or do you guys work together in terms of services, like cars from the dealership can come over and get detailed? Karolina Larson: Any car that gets sold at Larson Ford, any used cars, new cars, whatever it may be, those cars are brought over to our detail, Moose’s Auto Detail to get prepared to be sent out. We also offer $20 off coupon for a full detail and an express detail. It’s a great price, especially before the Spring. When the Spring comes, get your car cleaned. Tim Mullooly: Right, so you can take it out for a nice drive in the warm weather. Karolina Larson: Yeah that’s right, and the sun. Tim Mullooly: Yeah, and look good. How do you guys, especially being a relatively new business, how do you market Moose Auto Detailing? Is it mostly word of mouth? Do you do advertisements, referrals? Karolina Larson: Well, we do digital advertisement, social media, newspaper, word of mouth a lot. One of the other things that I really enjoy doing is going to businesses door to door, kind of like the old fashioned way, to get companies to see what we do and to offer coupons and to just have them give us the opportunity to do a good job on their vehicles. Tim Mullooly: Right. I think, like you said, it’s kind of old fashioned way but not many people are doing that nowadays, so I think that that’s a smart idea to kind of differentiate yourselves. Karolina Larson: I like the whole new age, social media, and obviously that’s an affective form of advertisement, but I always think doing things the old fashioned way sometimes is best, just like handwriting a thank you note. Tim Mullooly: It’s more personal. It helps establish a relationship between your business and their business. Karolina Larson: Plus, you’re face to face. Tim Mullooly: Exactly. When people come to work with you guys at Moose Auto, what would you want the number one thing that people should know about your business or walk away, taking away from working with you guys? Karolina Larson: Our main goal I would say for anybody that comes in, whether it’s businesses, retail customers, our main goal is to provide exceptional service at an affordable price. We don’t want to just make, like, a quick buck. We want to be able to keep customers long term and see them coming back with a smile, knowing that their car is going to be cleaned and their money is going to be well worth what they paid. Which is, number one, everybody, if they’re going to pay, they want to see exceptional service. I think, you know, at our Larson Ford dealership, over the years we believe our success is based off of giving back to local charities and the community, and that’s one thing, once we become profitable in the next coming months is to be able to do the same thing, to give back. Kind of spread a little bit of hard work to the community. Rob Larson: I mean, of course you want to make money, but for longevity, if you want to be in business and really get your name out there, you got to be a part of the community. You got to give back and we look forward to having that ability, to find a way to get more involved and make our business something that, people realize that there’s a bigger purpose for us and we look forward to that opportunity. Karolina Larson: If you look at our Facebook page, we have a lot of photos that we have posted, like our manager one day, he had his daughter come to help clean the cars, so it’s almost like a family affair. Everybody’s working together, doing whatever they can to pitch in. Rob Larson: We have another father and son that just started with us. Tim Mullooly: Oh no way, it really is a whole family affair. That’s great. Me personally, I think of a family business, you’re more inclined to trust them and you know have a good reputation and you know that they all can get along and work together and have a good business. I think that’s really great. Karolina Larson: As long as, you know, everybody treats each other with respect and loyalty and dedication, that’s really all you can expect. Tim Mullooly: Moving on from some of the questions more geared towards the business, we always like to ask a handful of questions to all of the guests that come on here. The first question that we usually like to ask people, how would you define being wealthy? Feel free to answer as individuals or if you want to answer together, because I feel like everyone has a unique take on what exactly wealth is to them. Karolina Larson: I personally, I think being wealthy means obviously, being able to pay your bills, because you need to have a roof over your head, but besides that, just being able to enjoy life. You put away some reserve money and some money for your future, and kind of be smart about it. Where, in the future, let’s say you want to invest in a home or you want to invest in a business. Why not start thinking ahead and also planning, and spend some of that money for pleasure as well? Tim Mullooly: I mean, the planning aspect, like you are referring to is something that we preach about a lot here at Mullooly Asset Management. We’re always big on planning and making sure you have everything planned out. Rob, do you have anything in terms of wealth that differentiates from Karolina? Rob Larson: I could mimic a lot of what my wife just said. I completely agree with everything. Being wealthy is definitely not just about money. As far as the money end goes, yeah, you want to be able to pay your bills, you want to have a little bit of a reserve money for an emergency, and you want to be able to have some extra money to enjoy your hobbies in life. I think that’s what brings happiness and peace, is when you can have the ability to kind of enjoy and do the things that you want to do. Overall, definitely being wealthy is just not feeling under the gun all the time. Not waking up in the morning and having that stress of, “Am I going to be able to make it this day or this week financially?” No, if you can overcome that, I would say that’s the kind of wealth I wish everyone could experience. Karolina Larson: I think overall, just being happy, like, with what you do and having a passion makes you wealthy in general. Your enthusiasm, your dedication, you know, your happiness, it kind of like exudes, and everybody else can feel that. Tim Mullooly: Kind of piggybacking off of what you just said, the next question I was going to ask, what’s one thing other than work that you have a true passion for in life? Karolina Larson: One of my main passions in life is being able to be healthy, fit, to workout. I think putting your energy and time into making sure you’re healthy, you know, eating right, working out, that will translate into being healthy in the long term, and overall just a better quality of life. The other thing that I absolutely love is boxing. Tim Mullooly: Oh, no way. Karolina Larson: I used to do karate for 10 years, and after that I started doing tennis and a couple of other sports. Just starting boxing, I have so much energy that boxing gets, like, all of my energy out. Punching hard, a different type of adrenaline. Tim Mullooly: Yeah, and like you were saying, it’s a great workout too. I know people that box. They are dead tired afterwards because they’re like, “Oh, my arms are so tired.” Definitely along the lines of staying fit, they kind of go hand in hand. Karolina Larson: In addition to that, just be able to have opportunity to travel, see different parts of the world. Financially, whenever we can, doing all of that. Cooking, I love to cook. Tim Mullooly: I can’t, I’m not much of a cook, so can’t speak to that. I’m good at pasta, and that’s about it. I can make pasta. Karolina Larson: Try Hello Fresh. We tried it for two weeks, awesome. Tim Mullooly: I’ll have to look into that. Rob Larson: I share a lot of the same passions as my wife, which is good. It’s probably why we’re able to be together. Rob Larson: Definitely, I have a passion for business, without question. I love the fact of having a goal and getting a team together to accomplish it. Also, not just being successful yourself, but seeing other people around you become successful, working together. I have a passion for that without question. Outside of business, I love to stay fit, do anything outside whether it’s working out or fishing or hiking, anything like that. Then traveling is definitely, probably my biggest passion. When I met my wife, one of the things that I loved about her is that she’s from a different country originally, from Lithuania. I know she moved over here and that’s one thing, besides how beautiful she is, that sparked my interest, to learn about where she came from and her language and culture. I really enjoy that. It kind of blended with what one of my passions was. We look forward to hopefully this year or early next year going to her country to visit her family there. Tim Mullooly: That’s very cool. When did you leave Lithuania? When did you come to America? Karolina Larson: I moved to the US when I was eight years old. The way I came here was, my mom, she actually came to the States and she knew little English, and this was when I was five years old. I was back in Lithuania with my grandma, my aunt, my grandad and my baby cousin. They were taking care of me and my mom was, you know, working nonstop for three years to bring me over here. That’s how I came over, from my mom’s hard work. Tim Mullooly: You said you like to travel. Being in a family business that works selling cars, is there any part of the world that you’ve seen that have different types of cars or cooler cars that you don’t usually see over here in America? Rob Larson: Sure, I mean, if you travel to Europe the cars are obviously a lot smaller, and we’re a Ford dealership and Ford has different models completely that they sell in Europe. Then also, if you travel to the islands, like the Caribbean, there’s completely different types of models that they offer in those markets as well. It is always interesting to see what the different types of models and vehicles that they’re providing in different parts of the world. Tim Mullooly: I’ve never been out of the country, so completely foreign to me. That’s a cool concept, though, to think there are different cars for different parts of the world. Rob Larson: Yeah, Americans, we love our trucks and SUVs. In other parts of the world it’s a little bit different. Karolina Larson: We love our F150 and Raptors, especially the Raptor. Tim Mullooly: Definitely an American car. Let’s say that you guys could go back in time, say 10 or 15 years. If you could give yourself one piece of advice for life going forward, what would it be and why? Rob Larson: I would say for me, it’d really be, don’t sweat the small stuff. I think when you’re younger you have a tendency to really beat yourself up, whether it be at work or a goal that you set that you might have come up short on. Everything’s a process, you know, you need to grow and experience and learn. I think going back years ago, I probably hurt myself more with accomplishing things by beating myself up more over little failures that I might have experienced, and I think if I just kind of let those things slide a little bit more and looked at the bigger picture and realized that, you know, it’s a process that you’re going through, a learning experience, those are things that I would have liked to have learned years ago. Karolina Larson: Well, 10 years ago I was 17, so I was just a teenager and learning and growing, kind of like finding myself, like every other teenager. I would say back 10 years ago, I would have just told myself don’t care what people think about you. Just do whatever makes you happy and go after your dreams. Tim Mullooly: Especially being a teenager, I feel like at that point in your life, that’s critical information to realize. A lot of teenagers get caught up in worrying about what other people think. Okay, so last question that we have here for you. What’s one thing that you wish you knew about money that you didn’t know when you were younger? Tim Mullooly: We see it all the time, people living way above their means. They should take your advice, because sometimes it’s as simple as that, in terms of money problems for people. It’s like, “Hey, you’re spending more than you’re bringing in. You got to cut back.” I definitely think that that’s a good lesson to learn. Rob Larson: I think you can never be educated enough about money, and I think that’s the most important thing, is when you’re younger having people around you and educating yourself on what to do with your money, how to manage your money, how to have a personal budget. I was blessed to get some of that advice at an early age, and it definitely pays off down the road. How to invest your income from your regular job so you’re earning money on your money and building up bigger savings. I got some of that advice, but you can never get enough of that. I think for anybody listening or anybody that’s interested in learning about finance or whatever it may be, you can never start young enough educating yourself. Karolina Larson: I wish they had that class back in high school. Tim Mullooly: Exactly. You know, that’s one thing that we’ve touched on a little bit in episodes before. High schools don’t require personal finance classes to graduate, and they say they’re preparing students for the real world, but they don’t tell them how to open a bank account or do taxes or anything like that. Karolina Larson: The other thing that I think the young generation doesn’t realize is, don’t use your credit card so much. That’s what gets you in trouble and it gets you in debt. Then you can’t buy a house, and then your credit goes down. You don’t want to do that. You just want to be able to have a roof over your head and not be in debt with credit card bills. Rob Larson: I’ve been saying for a couple years like you just mentioned, I think we’re doing a serious disservice to younger people to not make it mandatory that they have a personal finance class in high school and start teaching our kids at such a young age. You see people go to college and just make some serious financial mistakes with multiple credit cards and loans, whatever it may be, and it’s going to take them so many years after they get started in their career to dig themselves out of the hole that they created. Tim Mullooly: Right, I mean, college kids, they have to make such important financial decisions, and we don’t teach them the lessons beforehand, so how do we expect them to make good decisions if we don’t educate them on that stuff? Tim Mullooly: If you’re listening to this on iTunes, please subscribe to the podcast to get new episodes every week. Feel free to leave us a review or a comment, because it would really mean a lot to us. Be sure to follow us on Twitter and Instagram @lwm_podcast for more news and updates about the show. Well guys, thank you so much for coming in and answering some questions. I appreciate you taking the time. Karolina Larson: Thank you so much for your time. Rob Larson: Thank you so much, and come to Moose Detail to get your car cleaned. Karolina Larson: Don’t hesitate, Spring is right around the corner. Tim Mullooly: Yes, exactly. You want to have your car looking nice and spiffy so when the weather finally warms up, you can get it on the road looking good. In the show notes, I’m going to link to Moose Auto Detailing’s website and their Facebook page, so make sure to check them out, follow them on social media, and definitely go see them if you need your car detailed. That’s going to do it for this episode of Living With Money. Thanks for listening and we’ll see you on the next one.